There’s nothing like the smell of hot coffee on a cold morning. For some, it’s just what they need to go from “don’t even talk to me right now” to “woohoo, let’s get the party started”. However, sadly for some of us that warm cup of goodness can lead to cramps, indigestion or a very quick trip straight to the bathroom. 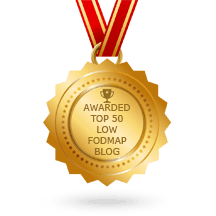 If you’ve been following a low FODMAP diet, you’ve most likely switched to a low FODMAP milk. So why are you still suffering and what’s really the story with coffee? First and foremost, coffee itself is low FODMAP. However, coffee is also a gut irritant, a stimulant and may contain other food molecules that some people are sensitive to. Do you have milk in your coffee? 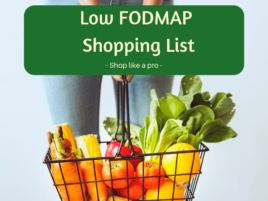 Firstly check that the milk you’re using is low FODMAP. Lactose free milk is usually the easiest low FODMAP swap. It behaves just like regular milk and is relatively easy to come by. Some people find it tastes slightly sweeter, but don’t worry about this, it doesn’t have added sugar. Lactose is the natural carbohydrate or “sugar” molecule in milk. In lactose free milk, the carbohydrate content is the same, but instead of being a double sugar molecule (lactose) it has been separated into single the sugar molecules, glucose and galactose. This means some people find they can taste the natural sweetness more strongly. If lactose free milk isn’t an option for you, there are other alternative milk products that are also low FODMAP. You might like to try soy milk made from soy protein isolate, almond milk or rice milk. Soy milk made from soy beans (hulled or whole), oat milk (more than 30ml or 1oz) and coconut milk (more than 125ml or 4oz) are high FODMAP, so be careful with these options. Caffeine is well documented as a stimulant, this means it can raise blood pressure and heart rate, cause the jitters and kick your metabolism into gear. All of this revs up bodily functions, and also stimulates gastric motility. In a nutshell if you stimulate gastric motility, especially on an empty stomach, the resulting muscular contractions along the digestive tract can cause cramping and help to “take care of business” in the bathroom department. Caffeine, catechols, and chemical-substances called N-alkanoly-5-hydroxtryptamides are all found in your cup of coffee and stimulate stomach acid secretion. This increase in stomach can result in heartburn and indigestion. Although these compounds can cause gastrointestinal issues, they are not FODMAPs and have a different mode of action. 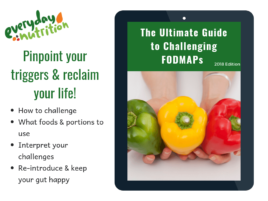 Salicylates are not FODMAPs and they have a different mode of action to FODMAPs, but they can cause similar gut symptoms. Only a small proportion of the population are sensitive to salycilates and the best way to know if you are one of them is to consult with a specialist dietitian. There are two considerations when assessing your tolerance to coffee. The more coffee you drink the more used to coffee your body will get. Someone who drinks several cups of coffee per day, will feel its effects less than someone who rarely drinks coffee. You can have a genetic predisposition for being a fast or a slow metaboliser. Have you ever wondered why some people can have a strong coffee and go straight to sleep, while others are up all night if they even smell it after 3pm? The answer is in your genes. If you are genetically prone to being a fast metaboliser, you will process the caffeine and flush it out of your system pretty quickly. Similarly, if you are genetically inclined to be a slow metaboliser, it will hang around in your system much longer. Coffee is good to drink and an interesting gut health topic. But if coffee is more your foe than your friend, there are several possibilities, encompassing aspects of both your food intolerances and your genetic makeup, to consider. Any food or drink that contains caffeine can have similar gastrointestinal effects, this may include coffee, energy drinks, pre-workout supplements, coca cola, tea and dark chocolate. While most people tolerate caffeine in moderate amounts, people who have IBS may find they need to limit themselves to 2-3 cups per day or less. If you find you are particularly sensitive, it may be worth trying half strength, decaf coffee or even switching to tea, which is naturally much lower in caffeine than coffee.